Сasino available on mobile devices. 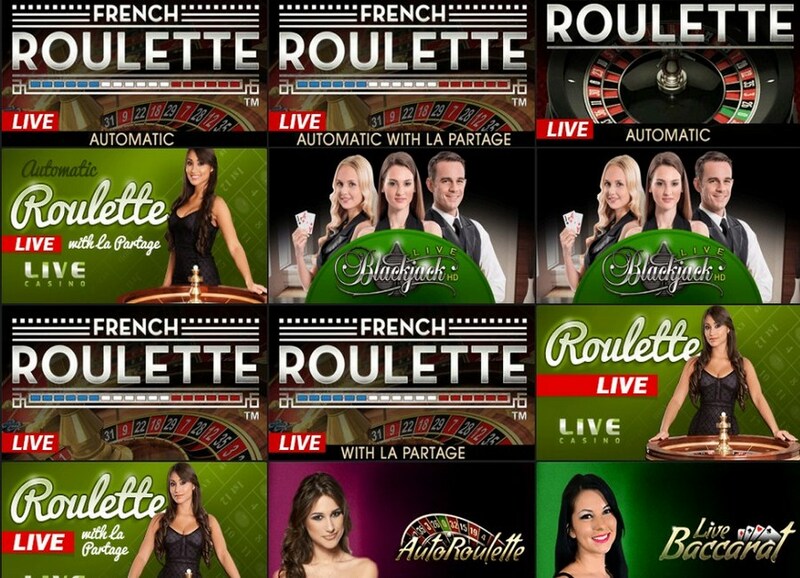 Live casino with live dealers. Not available to players from the USA and UK. company registered and established under the laws of Curacao. Jubise International N.V. is licensed and regulated by Antillephone N.V. Jubise International N.V.’s registration number is 132515 and its registered address is E-Commerce Park Vredenberg, Curaçao. Golden Star Casino was created for the people, who are looking for both entertainment and money. Never mind, whether you are a sophisticated player or just an amateur. Here you’ll find an appropriate game for yourself. The interface of the website is user-friendly. There is no need to spend much time searching for the necessary category. Everything is sorted accurately. As soon as you open the main page, you see all the opportunities available for the clients. It is clear enough that every new customer is welcomed here. The casino is operated by Jubise International N.V. The transactions and gaming process are transparent and fair. The resource works under the Curacao laws. Golden Star has international registration as well. All of these made the strong reputation of the casino and turned it one of the most attending even though it was launched only in 2012. Golden Star is also regulated by the independent authorities, such as Responsible Gaming commission and some others. The facilities of the website are developed by well-known companies Soft Swiss, Bet Soft, Microgaming, Amatic Industries, etc. That’s why their games are not only attractive but also reliable. All the users have unlimited access to them 24 hours a day. The gambking website is available in the majority of European languages. It is accessible from mobile devices to give you an opportunity to relax in any place you like. If you already have some preferences, you are free to use the filter and find your favorite game by the name of the developer or title. Among the popular facilities, there live American Poker, Aces Eights, Deuces Wild and plenty of other games, which might be played in real time with professional croupiers and gorgeous lady dealers. There are more than 600 games in total available in here. 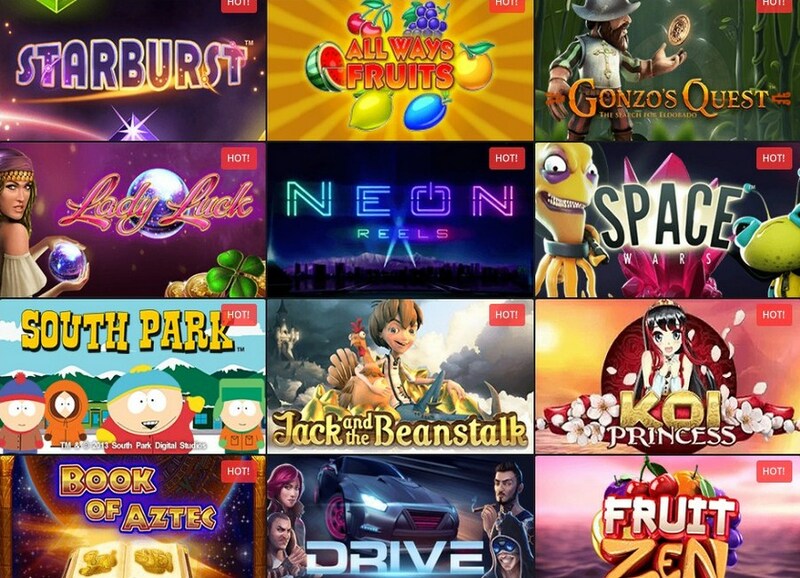 Cooperating with the world casino software developers, Golden Star keeps enriching their collection. Being a world-class casino, Golden Star also accepts bitcoin and all the basic currencies. The smallest amount of the deposit totals €10 or equivalent. The transactions for this type of operations are usually instant. The minimum sum for cashing out is €20. All the transactions are carefully checked and might take up to 24 hours. The biggest amount within one operation usually totals €2500 (for particular systems, it can be less). There are also limits for a day, week, and month. Payments are absolutely secure here. 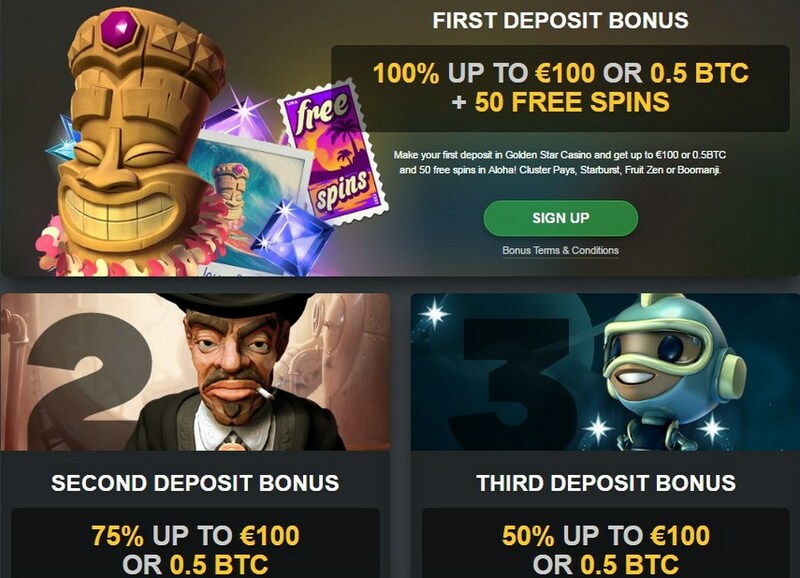 As soon as a new customer makes the first deposit, he or she will get 100% new player welcome bonus on their account. The total amount might comprise up to €100. Besides this, the user also received 50 spins for free. For the next two operations, there are bonuses as well. Thus, in general, you can obtain up to €300. While playing, users can get special points. When you have enough, you can exchange them for real money. Moreover, the more points you have, the higher your status becomes. Earning a better reputation, you’ll receive such privileges as better exchange rates, cash-back, and others. Golden Star offers new promotions every week. The players can get bonuses or cash-back for the deposits and many other things. In a case of questions, it is possible to contact the support team by e-mail, the special form of the website or live chat. FAQ is also available.